Happy pongal to all my viewers !!! Festivals is all about sharing sweets each other. 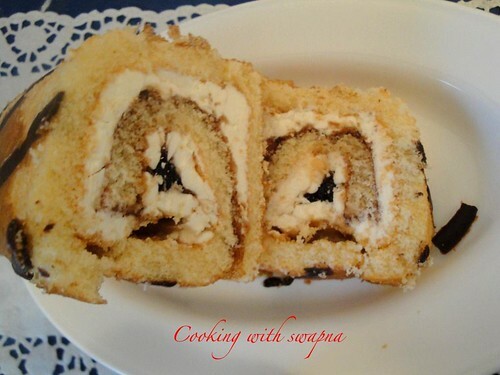 I would like to share this delicate & tasty swiss roll on this special day. 1. Preheat the oven to 210 C & grease the swiss roll pan. 2. Seperate the egg yolks & whisk it with vanilla essence & sugar till creamy. 3. Sift in the flour & gently fold them in the egg yolk mixture. 4. Whisk the egg whites till stiff & gently fold them in the cake mixture. 5. Gently pour the cake mixture in the prepared pan & bake it for 10 min or until done. 6. Immediately, turn on to a cake rack covered with clean tea towel. Allow the cake to cool. 7. using the whisk attachment on your electric mixer, mix the powdered sugar, salt, vanilla and milk at low speed until smooth. 8. Add butter, one slice at a time, until incorporated add shortening and whip at highest speed 10 to 12 mins. 9. Peal off the baking paper (if any) and spread the butter cream filling as the first layer & raspberry jam as the second layer throughout the cake. With the help of tea towel, tightly roll the cake. Refrigerate the cake for one hour & remove the tea towel gently & carefully. 10. 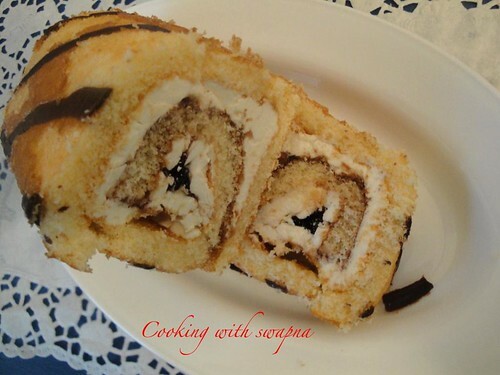 Meanwhile, melt the chocolate (ur choice) & decorate it over the swiss roll & refrigerate it.